These No Bake Sugar Cookies Bites have a soft doughy center and are coated in a sweet chocolatey shell. 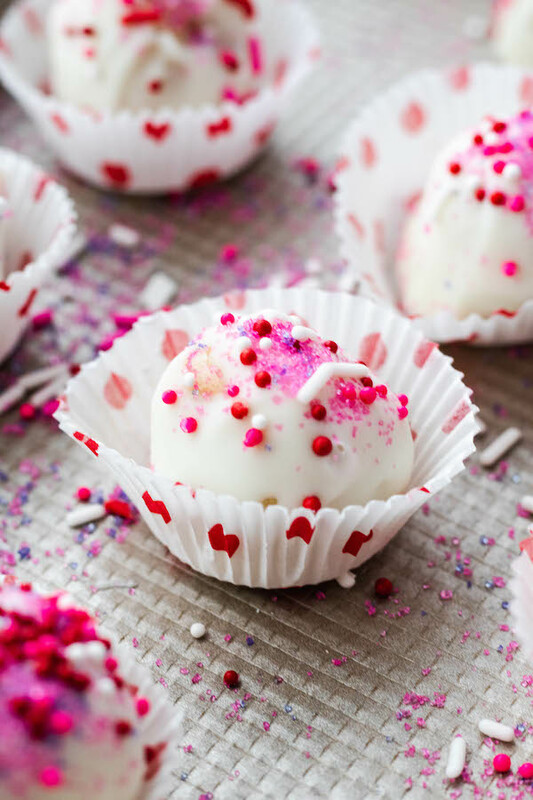 Perfect for Valentine’s day or a fun healthier treat. Happy Valentine’s day, lovaass! Can you believe it’s this week already!? 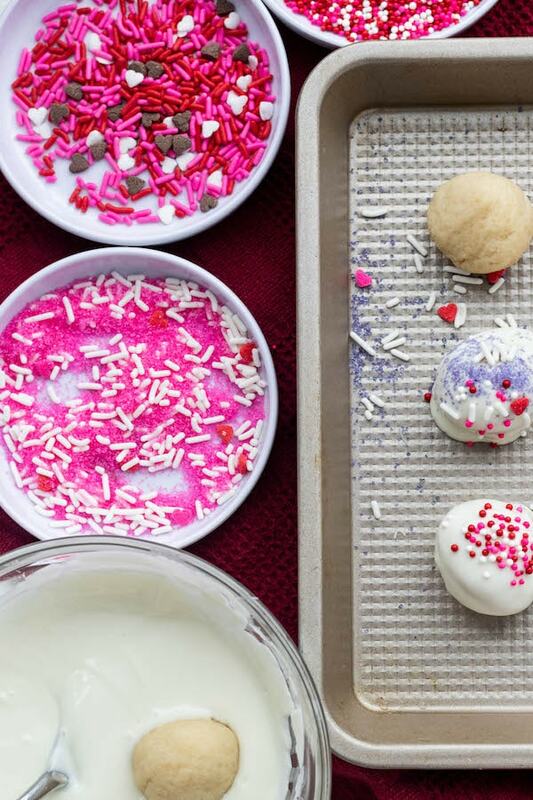 One of my favorite things about Valentine’s Day is homemade sweet treats. 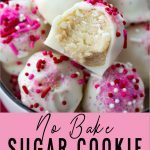 I really wanted to name these healthy no bake sugar cookie bites but I don’t think everything on my site should be labeled as healthy. You guys get the picture, I don’t usually cook with a lot of processed foods or artificial ingredients. These no bake sugar cookie bites are made with almond flour, a natural sweetener (maple syrup, honey or agave nectar), vanilla extract and cream cheese. 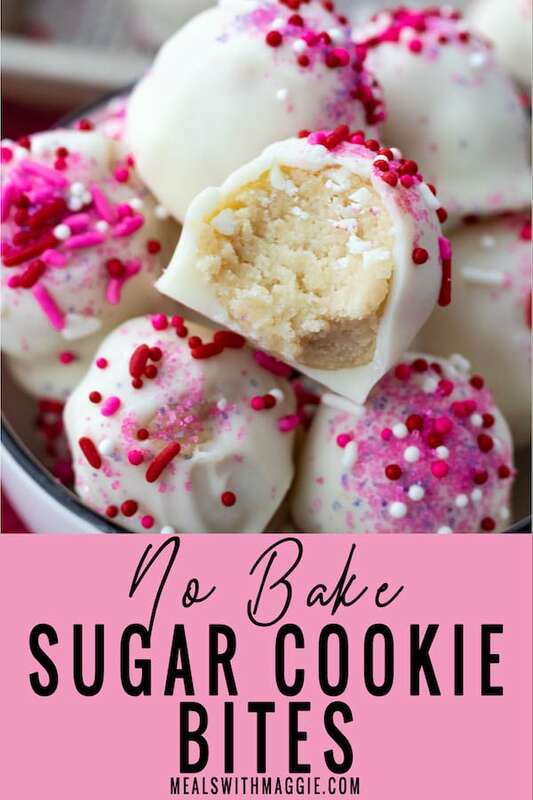 I also thought about naming these no bake sugar cake pops, no bake sugar cookie dough bites or no bake sugar cookie pops, but I liked the sound of bites better since that’s what they are! Little bites you can just pop right in your mouth. On a side note, I’ve been working my tail off to make this website easier to navigate though. Running this blog, social media channels and balancing life/work is not easy. I’m working on it. We are going up north this weekend to go skiing with friends and I had to tell myself, don’t bring your computer… like 3 times. 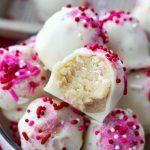 No Bake Sugar Cookie Bites that are healthy? These No Bake Sugar Cookie Bites are a bit healthier than the norm. I used Neufchatel cream cheese, which has less fat compared to the regular. I compare it to whole milk vs. skim milk. You are getting the same nutrients, but with less of the fat. 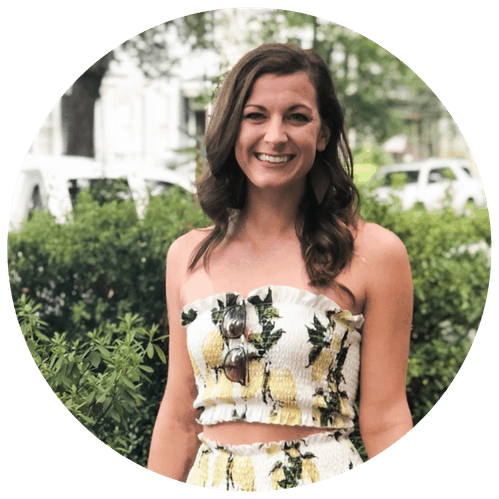 Another tidbit that makes these No Bake Sugar Bites healthier is that they are made with almond flour, which contains heart healthy fats, protein and fiber. I’ve used almond flour in a couple of my other recipes like these Lemon Blueberry Muffins and this Oatmeal Chocolate Chip Cookies. If you are avoiding gluten no need to worry because almond flour is gluten free. I’ve made so many batches of these already. The sprinkles make it so fun! I think I bought these sprinkles at Target on clearance last year. You can find these fun sprinkles on Amazon too. They store in a airtight container in the fridge for 2 weeks (if they last that long!). These No Bake Sugar Cookie Bites have a soft doughy center and are coated in a sweet chocolatey shell. 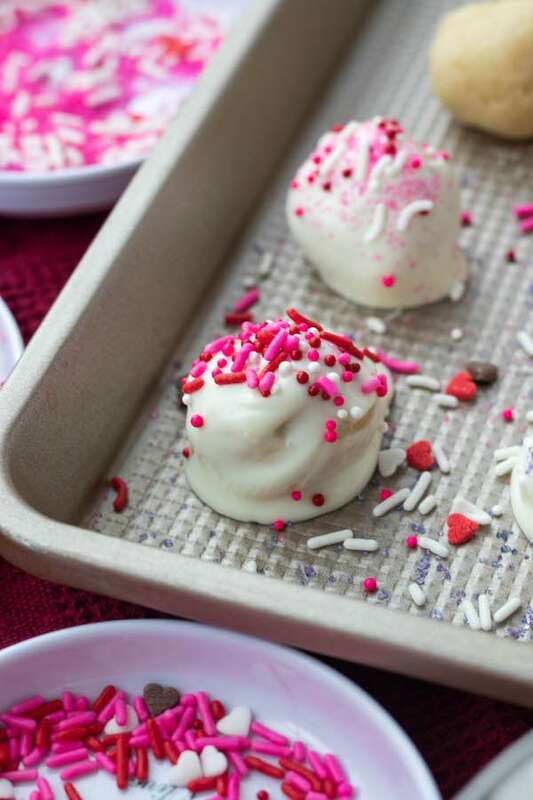 Perfect for Valentine’s day or a healthy gluten free treat. In a microwave safe bowl, melt cream cheese on high for 1 minute. Once cream cheese is softened, add in sweetener, vanilla extract and stir until throughly combined. Add in almond flour and mix until incorporated. This should form a dough like consistency. Line parchment paper or oil on a sheet pan and roll 1 tablespoon of the sugar cookie dough into balls. Place in freezer for 5 minutes for a quick-chill. While the sugar cookie filling is in the freezer, melt chocolate chips and coconut oil in a microwave safe bowl until it is completely melted. Remove cookie filling from freezer and carefully dip each ball into the melted chocolate and return it back to the sheet pan. If you are adding sprinkles, do so quickly because the chocolate will harden into a shell. After coating each ball with chocolate, return to freezer for a 5 minute quick-chill. Can sub honey or agave nectar for maple syrup, but this will change the flavor a bit. I used vanilla white chocolate chips because that’s what I found at my local grocery store. These look SO good! My little guy has a nut allergy, so unfortunately we cannot make as it. Do you know how these would turn out using a different type of flour? Thank you! Hey Brit! I have only tested them using coconut flour, which the FDA recognizes as a tree nut. You can try using all purpose white flour, almond flour is very absorbent so you might need to play around with it. I would start by using 1/2 cup white flour and gradually increasing it until you’ve reached a “doughy” consistency that can be easily rolled. Hope this helps ! Let me know how it works! Loving these! They taste delicious while actually staying quite healthy and filling. They aren’t full of sugar and have lots of protein. 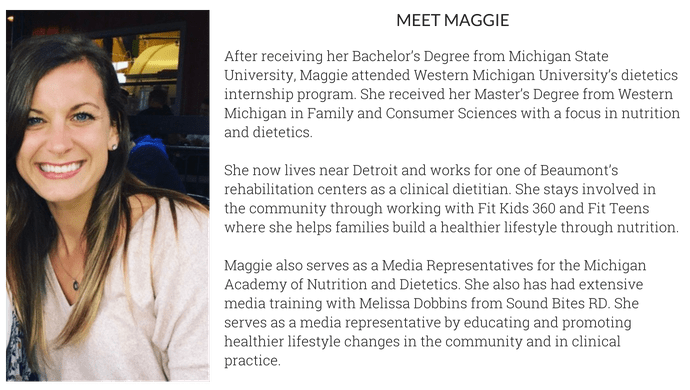 I love Maggie’s recipes.